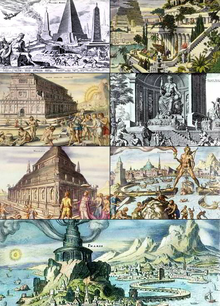 The Seiven Wunners o the Auncient World (frae left tae richt, tap tae bottom): Great Pyramid o Giza, Hangin Gairdens o Babylon, Temple o Artemis, Statue o Zeus at Olympia, Mausoleum at Halicarnassus, Colossus o Rhodes, an the Lichthoose o Alexandria as depictit bi 16t-century Dutch airtist Maarten van Heemskerck. The Seiven Wunners o the Warld or the Seiven Wunners o the Auncient Warld refers tae remerkable constructions o clessical antiquity leetit bi various authors in guidebeuks popular amang auncient Hellenic tourists, pairteecularly in the 1st an 2nt centuries BC. The maist prominent o these, the versions bi Antipater of Sidon an an observer identifee'd as Philo o Byzantium, comprise seiven wirks locatit aroond the eastren Mediterranean rim. The oreeginal leet inspired innumerable versions throu the ages, eften leetin seiven entries. O the oreeginal Seiven Wonders, anly ane—the Great Pyramid o Giza, the auldest o the auncient wonders—remains relatively intact. The Colossus o Rhodes, the Lichthoose o Alexandria, the Mausoleum at Halicarnassus, the Temple o Artemis an the Statue o Zeus war aw destroyed. The location an ultimate fate o the Hangin Gairdens are unkent, wi speculation that thay mey nae hae existit at aw. ↑ Anon. (1993), The Oxford Illustrated Encyclopedia, First Edition, Oxford: Oxford University. This page wis last eeditit on 9 Apryle 2017, at 00:26.